Part 1MI-4 History Russia had no medium transport helicopter available at this time therefore the Russian government on October 5, 1950 had signed an order for a helicopter capable of transporting 12 persons or the Gaz 69 jeep or Pobeda car or 57mm and 67 mm guns. The task was authorized to the Mikhail L. MIL OKB which had had to develop and construct the aforementioned helicopter within one year. MIL duty designed a helicopter of similar conception to the US Sikorsky S-55 with a nose mounted engine. The ASH 82 v engine of Shvetsov design was chosen as a power plant. The mock up was ready at the end of 1951 and as early as April 1952 the test trials of the MI-4 had begun. The helicopter went into production in December 1952. More than 3200 helicopters were produced with more than 700 being exported to more than 30 countries. The beginning of this venture started about a year ago at the Pasadena Modeler Society contest where I bought the kit for a very reasonable price. I had just finished my McDonnell Douglas helicopter in 1/35. I was looking for a kit that wasn’t in the book of commonly represented kits at model shows. I saw the MI-4 Hound from Trumpeter and I was sold. Opening the box revealed a large kit with nicely done details, but with room for improvement . . . I couldn’t wait to start, but I needed to get as much material as I could get my hands on for this Helo before I started building. Only there wasn’t much, a few photos here and there on the internet but nothing that sparked my interest. I even e-mailed the Mil Factory in Russia for any pictures they might want to release . . . But for some reason I never got any response. I finally came across the only book on that Helo from Eastern Europe, the MI-4 Hound “IN DETAIL” with multiple photos on the airframe, interior cockpit, cargo bay, cowlings, rotor details and engine detail . . . Wow! Did I say engine details!? Because of that, I knew I had to show this helo with everything open. The kit did provide an engine, but the scale was off and lacked the details I thought were necessary, so I wasn’t really impressed. It was back to the internet to try and find something to replace the engine kit. 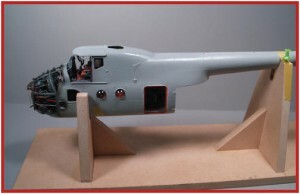 I found one from “Engine & Things” (resin engine) the “ASH 82” engine that fits that particular helo. The next order of business was to find photo etched parts for the engine, but once again I couldn’t find anything at all. Again, I would have to improvise and another search ensued. The closest that I found was the company “Part” that had a couple of interior/exterior photo etched sets for the Hind, so I bought both of them. I was sure I could find something amongst them for my helo. I came across the “Eduard” interior photo etched for the Bell Huey and again was sure that I could find something to use there as well. Now I could finally start building. I started with the kit seats but again they seemed out of scale, so I had to come up with something else. I had the Huey kit from “MRC” that had some nice seats in it and the photo etched from “Eduard” had a nice set of seats belts to go with it so I used those. In the MI 4 book there was a picture that showed that over the pilot seat there was some kind of a half-round hooded umbrella (used for instrument training) and I decided that I wanted to represent that as well. I tried to use toilet paper dipped in white glue. It didn’t turn out too well . . . actually it didn‘t turn out at all. I also used regular aluminum foil but super glue did not attach to it well enough. I even tried painting sheer stocking material and again, disaster. I finally used “black wrap”. This is a product that’s used on movie sets to cover lights. It’s a little thicker aluminum. I bent it into shape, added a wire framing, painted it, and I was done. I then cut the cockpit floor behind the co-pilot seat in order to show a connection between the cargo bay and the cockpit just like in the real helicopter. I detailed some of the instrument panel wiring with plastic sprue, as well as photo etched from Part and Eduard. After that I added both sun visors from clear sprue and painted them blue, and of course “Future” for gloss. Then I attached it on the overhead instrument panel and painted the whole cockpit German Grey from “Tamiya” paint. A last oil wash in brown and black and my cockpit was done. Overall I put in about 35 days on cockpit. Trumpeter does not provide anything for the cargo bay other than the floor and the cabin roof. The floor was bare of any detail so I had to come with something to make it interesting. If I wanted to have the cargo doors open a lot was going to be seen inside. Reading the few books I have on armor detailing I came across a photo of a tank with diamond plate on the floor. I liked that so it was back to researching on the photo etched plates. Reliable Eduard had several types. I cut the plate to match the floor and was pretty happy with the results. I wanted to put seats and seatbelts in the cargo bay. I used the interior detail set from Eduard for the CH 47 Chinook Helicopter. The cargo bay still looked empty, it needed something else. The MI 4 book didn’t show anything other than seats so I went back to the internet. This helicopter was used for a short period as a platform study for sub-hunters. Voila, I had my interior. After careful research, I found there aren’t any after parts for consoles in 1/35 scale. I had to start from bare sheets of plastic. Back to the internet again for research of the shape and design. I found the Seaking helicopter book “In Detail“. There were a lot of photos of sub hunting equipment. I also came across the Kamov 27 Russian helicopter book with some interior photos of the wiring and consoles. Now, I had enough research to start. Measure, cut, cut some more and some photo etched from Part and I had my interior done, unfortunately resulting in a lot of wasted plastic sheets by the final product. First I painted everything black to do some pre-shading. After that I used German Grey to paint the various consoles. The cabin floor was painted black first and then I mixed it with white to really fade it out. The electrical boxes were also made from plastic sheets and were painted black and white. All the various knobs are either photo etched or punch disks in various sizes from the “Waldron” punch set. Everything was oil washed in brown only and given a worn out look with silver paint chipping, I also used MIG pigments for the floor to simulate heavy walking. I installed LED lights (green & red) on the cabin roof, painted the interior walls and cabin roof German Grey then heavily oil washed with a brown color thinned with thinner. 3 months later the cargo bay was completed. The resin engine was from “Engine & Things.” I started with washing the part in detergent and hot water. I drilled various sized holes in the resin engine in order to accommodate all the wiring later. On the cylinder I also drilled holes to attach the metal return rods that were bent and installed after painting. I added various gizmos from my spares box in order to busy up everything. I added shrink tubing to solder wire and bent it into shape to simulate various hoses. The engine was painted black then toned down with heavily thinned down grey. When it was completely dry, I oil washed with a combination of brown and black. The engine was repainted 5 times because I didn’t like the color combination or the aging process. Finally, the engine turned out exactly I envisioned it. After all that I added the metal rods to the cylinders and started some of the wiring and installation of the various rubber hoses and fuel lines. I put the engine aside and started on the next step. No engine walls are provided by Trumpeter. I had to create them in order to hide the inside of the helicopter. I built 2 of them: the first directly in front of the cockpit that was glued to the inside of the helicopter by 2 plastic tabs. Because the engine was heavy, I put a metal rod running through it from the fan to the first fire wall in order to keep it secured. Since all the cowlings are open I had to add ribbing to the firewall and attach a battery, oil system and extra gismos to make it look more realistic. I also drilled a bunch of various sized holes in order to accommodate extra wiring later. The second firewall is in front of the engine. It divides all the wiring from the carburator and start up system of the helicopter from the heat of the engine. I had to scratch build that item as well and add the ribbing on both sides since it was going to be seen. Numerous sized holes were drilled on both sides. Everything was painted black first, then khaki green and faded out with white. Then silver chipping was added and a heavy oiling in brown. When everything was in place, I sprayed a very diluted Nato black mixed with matt finish over the entire engine in order to blend everything together. It came out to dark for my taste. I glued the engine, cabin floor, cabin roof and cockpit one item at a time after multiple dry fittings of all items. I even detailed the top of the cabin roof with wires and metal rods in order to duplicate the rotor shaft from the engine to the tail. Unfortunately it can’t be seen at all, but it is there. When the second half of the fuselage was finally glued I could start on the remaining wiring in the engine, although I still had to paint all the various size plastic wires in several colors ranging from red, black, yellow and Alclad chrome. This took almost a week, working 2 hours or more each day to do all the wiring of the engine. Many had to be repainted because they would break or start flaking upon bending. The time spent on the engine was about 3 months from start to finish. After inspecting the fuselage I noticed there were a lot of little rivet holes everywhere, so that I would have to be very cautious with my sanding (yes sanding is my least favorite thing). Because the fuselage seams were slightly warped I slowly put it together with CA glue in spots, sanding as I went along, to bring the warp together. First, everything was taped very tightly with blue tape (stronger than Tamiya) to the seams and CA glue was applied with toothpicks at 2 inch intervals then sanded each time once dry to the touch. I started to do the rivet hole work within 30 minutes of all my seam work while the glue was still pliable, otherwise the effect would have been ruined. Even if this sounds like a quick job it took 3 days to complete. disappointed by the performance of the Eduard masks, in my opinion they didn’t live up to their claims. I laid out all the small parts that I could not attach on the helicopter on a large piece of cardboard so that I could paint them the same color as the helicopter. Once all that prep-work was done (I don’t use regular primer on my models . . . why add more paint coats!) I painted everything one thin coat of Nato Black from Tamiya and let it dry for a whole day. The next day I started making all the various panel and rivet lines darker and left them to dry for a whole day. The black was used for two things, primer and pre-shading. I then applied two very light coats of dark gray in order to add another pre-shading color to the helicopter, and let it dry for another day. I could now start on the main color of the helicopter, which was going to be a very light gray. I sprayed a total of six extremely light coats (almost a misting) over four consecutive days. I had to spray either heavier or lighter to certain areas to create some scale effects. It may sound like a lot of paint coats but everything was spayed very light and misty throughout the whole process. Once all the gray base color was done I went back with a very diluted mixture of the base gray and black to accent more panel lines. I found a photo of a helicopter with a wavy green pattern that was very different from most of the patterns that I had seen before. I blew that photo up by about 300% to match the size of the model in order to cut out the various patterns. This was going to be my first attempt at doing any camouflage work. I was too nervous that I would ruin all the work I already completed, so I decided experiment on something else other than the actual helicopter. I painted several color combinations and patterns on a plain sheet of styrene. I scribed them beforehand in order to do washes as well. Once that was all done and I was happy with the results it was time to start the real camouflage. I started cutting the various patterns from the photo and transferred them onto blue tape outlined with black sharpie. I did a negative and positive set of “stencils” this way. It took all day to cut, paste, and paint the first coat of the green. After this initial coat of the second color I put everything to rest for the night. The next day I started with the green color again but added white to start fading the different panel lines. Instead of lightening all the various panels in the middle, I painted in an up-and-down motion so that it gave me a faded look throughout the helicopter. Once this was completed it needed to rest for one more night. When all the paint was completely dry I took the green and mixed it with a diluted black to outline the panel lines. Again everything needed to be put aside to dry for a day. Overall the painting process took about a week to complete. I started with one light coat of future and let it dry for a day. I then applied another light coat with another day for drying. It was now ready for decals. The stock decals from Trumpeter were trimmed in order to remove as much of the film carrier as I could. I dry fit them first to make sure of the exact location that I wanted them placed to avoid mistakes later. A little bath in warm water, a little bit of Microsol on the model and they are ready to apply. But as soon as I put them on the model they came apart in several pieces. I thought about getting rid of them entirely, but I wanted to see if I could fix them (ego, ego). I applied extra water in order to slide the pieces around easier and let the puzzle games begin! I only had to apply four decals on the entire model but one by one they all came apart. I spent the whole day trying to fix each of them. When all the pieces were finally together I let them dry completely for a day. When I went out the next day I found that there were several air pockets. Still not wanting to scrap them, I either pricked them with a needle or sliced them with an exacto blade, then applied Solvaset in small quantities over all of the decals. Several light layers were applied over the next few days. I wasn’t completely happy with the finished results, but it would have to do. I realized that I should’ve made stencils and painted them on the model instead . . . well live and learn. The next step was another coat of future to seal everything. I would still have to paint more panel lines over the decals in order to age them and match the helicopter. This decal adventure turned out not to be fun at all. Another final coat of future was applied over the entire model and let dry for another day. Then it was time to start on an oil wash. I was going to just use a brown color wash but was given some advice by Dan Clover, (thanks Dan) that possibly a raw umber might compliment the green camouflage better. I tried it and really liked the results. excess is wiped off with q-tips dipped in Turpenoid, in a up and down motion. This process took about two days to complete. 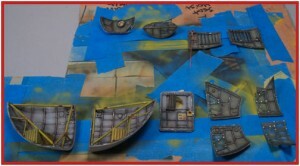 After that, I applied washes in different colors to simulate oil stains and slight rust. I choose a sienna brown and some black added for the oil. When all washes were done, I sprayed a very diluted black (95% Tamiya thinner and 5% Nato Black) all over the model in order to blend all the colors together and once more left it to dry. Going back after the washes were dry I applied light coats of a clear flat finish. I also sprayed only the bottom and mid-fuselage with a mixture of Mig pastels (Russian dirt color) and Tamiya thinner to simulate dust from the fields. All paint chippings and foot marks were done with Tamiya Silver straight from the container. I had to attach all the open panels, cargo doors, and side access door by cutting a small metal rod for each part and then drilling that into both the part and the model. Once the rod was inserted I glued it all in place. I had to do this because the gluing surface was to small, and I wanted the joints to be strengthened. I created various oil stains in the engine area and below the aircraft fuselage straight from a tube of black oil paint. This was rubbed in with q-tips. I wanted to create a snow scene over the wooden base I had made (more about the snow below). The helicopter had to be attached to the base. 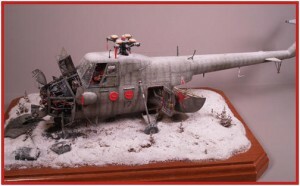 I was confused whether I should put the snow on the helo before I attached it or after. I decided that I would have to handle it too much to attach it so the snow would have to be put on the helo after. I was worried about handling the model too much in attaching it to the base. I drilled a little hole at the bottom of the fuselage and into the base and inserted a small metal rod and glued everything together. Luckily it went fine. I spent a lot of time on the internet trying to find the best snow product on the market, and let me tell you I found a lot of them. I tried several products on trial wood boards ranging from baking soda, baby powder, flour, snow coat products, Techstar, and Woodland Scenic. I even tried some special effects makeup products. Nothing worked. Frustrated, I got some advice from my fellow modelers to give Hudson and Allen snow products a try. I did, and finally I got the look I wanted . . . except I really didn’t know how to use it. When I tried it out on an old model it didn’t look right. The snow didn’t come out to scale and looked distorted. I was told I needed to thin it down through two layer of sheer stockings that would need to be stretched. I devised a gadget with a wire hanger and small clamps as a frame to stretch the stockings over to get the the snow to the right consistency. All of this was still trial and error. Before applying the snow I had to lightly mist everything with water. I found that Evian mist worked the best. It’s spray was more consistent. The snow was lightly sifted through the sheer stockings about 15 inches above the model. Once that was done it needed to be misted everywhere again with the Evian to even out the snow. I let the snow dry for about 45 minutes and applied a second coat. I forgot to mention that Hudson and Allen products come with and adhesive mixed with the snow. Once the snow hits the water it activates the glue. This was the first Russian helicopter I’ve ever built. I never put anything together from Trumpeter, or anything of that size for that matter. I enjoyed all the crisp details from the kit and the plastic was pleasant to work with. It was quite an ambitious project for me and was very challenging at times. For the most part the kit went together well. I felt that the only real problem area was the attachment of the blades to the main rotor. The blades were too heavy to be supported by the rotor plastic piece and they looked too droopy. The angle of the blades looked odd, or like they might even break. If I was going to use them, they would have to be reinforced with a metal rod. I found that some small parts were very fragile and broke in half with too much handling or sanding. Overall I was sold by Trumpeter and can’t wait to use their products again in the future. I can’t decide on my next project a Helicopter or plane? The Mil-17 looks like another great project! Or maybe the upcoming 1/35 Harrier or Intruder? P.S. A final note . . . it’s Friday night and the model is 99% done . The Pasadena Modeler Society contest is around the corner on Sunday. I just finished the last coat of snow on all the main rotor blades and I’m getting ready to attach them. For some reason they look awful. The blades seem to be dwarfing the whole model and base. Conceptually, it just isn’t working. So now it’s time for plan B. I remembered that one time I saw a photo of a Hind without blades and decided I liked that look. Since I’d already designed it to look like the helo was being worked on I opted not put on any of the rotor blades, but only the main rotor. So now all that’s left is to paint weather, glue and put snow on the rotor before Sunday . . . better get started. Sometimes you need eyes other than your own to point out mistakes or things like odd color combinations. My wife was extremely helpful in pointing out these various kinks to me when I’d hit a road block (and there were many along the way) she’d help me push through and keep going. Without her this helicopter would have taken flight (to the garbage can) more than once. Thanks Vicki. Thanks to Marcelo for his wonderful photos. Thanks to Dan Clover for his help on color washes. And a special thanks to Ken Schwartz for his patience with me and my numerous phone calls when I was stuck and didn’t know how to handle things. Your work has always being an inspiration to me. Also, everybody at the model club for their input during club meetings.